Reign Pro is an HTML5 Bootstrap 4 Website Template. Crafted with Bootstrap 4, HTML5, CSS3, SASS & jQuery. Headstart your project with a professional look. Headstart your project with a professional look with Reign Pro. Built on to of Bootstrap 4, with its uniquely cool layouts and life-like animations, Reign Pro can give your project the look and feel of a masterpiece! No matter whatever website you have intended to design, whether it is a Business, Agency, Tech-Startup, Drone photography or anything else, REIGN PRO can do the trick for you. It’s the most downloaded and one of the best HTML5 template designed by ThemeWagon team. If you can show me the wordpress reign template - maybe I can buy it? Seemingly this is the best website template I have ever used. As I haven't bought too many templates so my experience is limited on this. Anyway, I'm very happy with this product as it served my purpose accurately. Reign is entirely exceptional to me. It feels good when I browse through the template. Everything is just the best I could ever find! coding, design, features, flexibility, quality. Reign Pro is what I have been looking for. It's just perfect. Every section, typography, elements are cool. I got A+ customer support. Really appreciate it. As a web developer I have to build lots of website per year. Where I get stuck is to think about the design. Regin Pro successfully saved my times and efforts with its brilliant interface and versatile functionality. I loved the design overall. 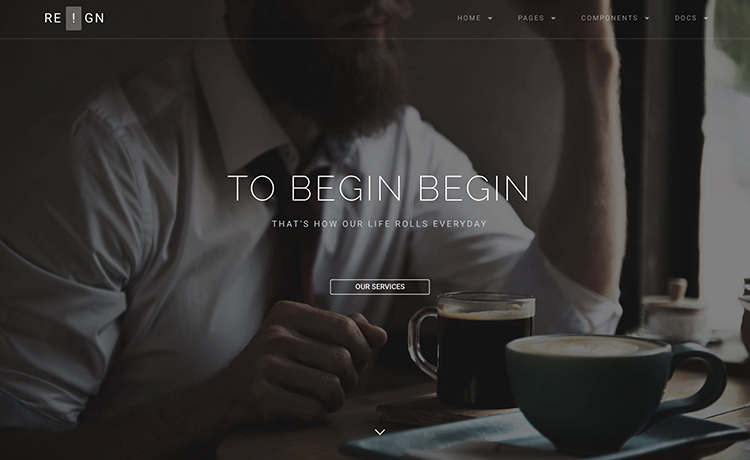 This sleek, minimalist, responsive site is a great template to spend your money for. I just bought this template and I inserted the Link for the YouTube video… but nothing happens… the image still shows and there is no explanation on how to change that in the DOC. Suggestions? Do you plan to update this to use bootstrap 4.0? Yes Kristin. Very soon we’re going to update it. Hold tight for a while. Thanks for your enthusiasm. Firstly, what is the difference between Reign & Stoic, that Stoic is expensive. Is it just because Reign is HTML and Stoic a wordpress theme? In both cases, the both function well in WP, rite? Secondly, I’m not a developer and would like to know if email, phone and social icons can be placed at the top in the header as I don’t see the option. Hello Edwin, thank you for contacting us. 1. You’ve got it right. Reign is HTML and Stoic is WordPress. As you mention you’re not a developer, I suggest you to go for the WordPress version because WordPress themes are easier to customize. 2. The icons are not added at the top because of the design scheme. But you can place them in the header anyway. Please don’t hesitate to ask if you have any further queries. I’ve purchased Reign but I’ve just realized that icons like arrows and symbols are not visible in Firefox. Any solution please? Please open a support a ticket. The link is here. Hello, Is Version 2.0 available for purchase. Actually, we’re planning to update the template very soon as enthusiastic people like you appreciate us. We’d like to convert it to Bootstrap 4, especially. Do you have anything in mind what you want to see in our next update? Thanks. I downloaded the free template. WordPress is on the web server. In the Templates section it is written that this template does not have a parent template. So how do you test it? All the templates you find on this site are HTML templates. You can’t use them on WordPress. Hi! I would like to buy the WordPress Reign Pro version. Is it available? Where? I have some good news! Premium version of Reign is now available. It’s called Stoic. Please visit here to know more. What version of PHP is Reign compatible with? It’s supposed to work with PHP 5 and 7. You will get support if you need after purchasing the template. Is there a youtube video that walks a beginner through the process of customizing the Reign 42.1 template. I fill like I’m missing something. Is WordPress version available for Reign Pro? If you are interested I can send you the download link. It will cost you $59. I like to buy the wordpress pro version. Where can i find it? You can find the wordpress version here. I like your theme from all perspectives, and I’m thinking of purchasing it. However, I’m looking out for the wordpress pro version, but can’t seem to find it. When I install the lite version in WP, the link to the pro version is broken. Also, is it possible to achieve the same kind visual attractiveness with the WP version? Like the loading bar, and unique urls for portfolio items? You can find the WordPress version here now! The comments for version 2.0 says the slider fixed for small devices. Sorry but the images don’t resize for the slider on the iPhone or iPad. They are full sized and all you see are grainy pixels. Video full screen or classic also doesn’t play on either device. It is not a safari issue as it plays on the iMac running safari. Can these two be fixed please. Nice theme but the slider full screen or slider classic does not work on apple phones or tablets. Is this being fixed in the near future? Hello, i purchased html5 version, when wordpress version will be available? i purchased this theme and i cant get the one page slider to work on an ipad / iphone, I really need to get this fixed asap, so any support would be greatly appreciated. great template but am still having problems with the images and scroll on ipad, the images are not shown and the scroll jumps back to the section. Is this ready to use in WordPress, or I need to manually do adjustments to the files for wordpress use? Currently, the process is ongoing to convert this HTML5 template into WordPress. Hope you will find the initial wordpress version among 1 month. But if you use it just now, you have to use it manually. So is there any document that can help me get the theme installed manually on my WP instance? Unfortunately, no. There is no such document to install a HTML template in WordPress instance. You have to change the ‘autoplay’ option of owl carousel. In main.js file, for testimonial section the value of this option is only ‘true’. You have to change the value as your desired time to show. Default time of owl carousel is 5s. If you change the value to ‘6000’ instead of ‘true’ then the slide will stay 6s. Thus you can control the time of each slide. Unfortunately I’m not very experienced with js. and need some help if possible. 1) Seems like somethings wrong with the “index__op__slider_full_screen.html” when resizing the window another slide show up on top – before the menu. This happen only on the slider versions. 2) How to show only one filter (isotop) when page load? The contact form doesn’t work for me. I changed the email address in the php file ‘contact-form’ but I don’t received the mail. Heeey ! I have a problem with the theme using an iPhone 4. The theme appears as black.. How to fix this ? Hello , thank you for your work! there has many jquery plugin to style those elements, you can use those. I do not recommend this template. Not good working on iPad, the page jumps up and down. How to modify map location in the contact page? You have to just change the latitude and longitude to change the map. In the documentation we have show that how to change. Which file contains lat long information. Currently the themes navbar is transparent. How can I change it a solid color Navbar? We have a solid color css class for the navbar. Please submit a support ticket and our support engineers will help you about that. Hello, I’m french. I look for some help with an template “RIGN – v1.1″ How to use this template for one web site ? I’m not programmer or disigner. Juste I need use this preview like” it is. Tank you in advance for help. Hello @disqus_XZeozIPBwM:disqus, You can purchase the template. All the codes are in html so once you download you can just replace the images and you are ready to go. this template (Reign Pro) support Cyrillic fonts? Can a single license be used for commercial purposes? Also how much control do we get to modify color schemes etc once this theme is purchased? Hellp @ptreh:disqus, You can use single license for one end commercial project. If you want to use more than one commercial project you have to buy developer license or extended license. Hi. Please let me know, if the template which will be available for download will have option for the jekyll version? Sorry for the blank files. We have fixed that in the latest build. I want to purchase this theme but i dont have paypal account. Can i purchase it using VISA debit card? Currently we are only accepting paypal, But I think you can easily pay using your credit card in paypal. If you need a custom invoice where you would like to use visa card please submit a support ticket. Is it possible in this template, exactly on the side of the portfolio, open images on the same side (larger in the middle) without opening a new page? Hello @disqus_XjAwuAKaLP:disqus, You can use lightbox for portfolio. If you need any help please submit a support ticket You get help. Could you tell me if .mov are supported by your bootstrap? I would like to host my video directly on my website. Thanks. I’m not a professional web developper, may I ask you how easy it would be to make this template multi-lingual ? As it is a html template so You have to just make two version of your site for language and you have to just add a language link in the menu. It will work for multi language. I purchased Reign and no PHP for the contact form was included in the package. resent, also would you please create an account in themewagon so i can attach the purchase your account.